I have a confession to make: I'm a little lazy when it comes to desserts. I love eating them, but the whole making them/cleaning up a whole bunch of dishes in the process thing just doesn't always feel worth it to me. So we usually skip dessert & I save it for the holidays or an occasion when I've got a little time & patience to spare in the name of a special meal. This dessert, though, has been made twice in one week. Just for the two of us. That is saying something my friends! It's really, really easy. It's the "one dish meal" of desserts. Slice some apples, toss them in a greased dish with a couple of ingredients to make a yummy "pie filling" sort of situation. Combine your crisp topping in a bowl and sprinkle it over top. If I can do this on a weeknight- you can do this any old time. Especially for a holiday- which it is perfect for. It's got all the flavors of a delicious, buttery pie, but without the work of a crust. 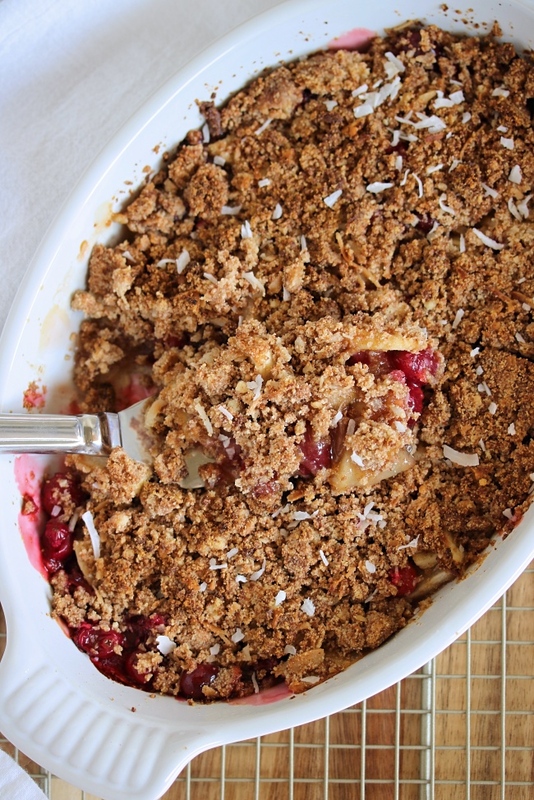 I love the cranberry-apple combo, but you can totally substitute all apples if you'd like. 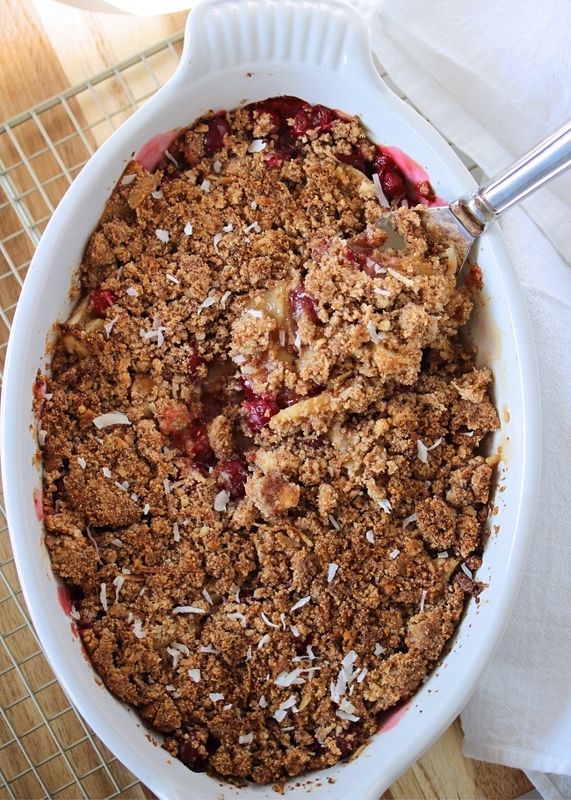 Or, try replacing the cranberries with any berry you love. I just like the mix of these two for the whole tart-sweet combination... I can't get enough! Try this for your holiday feasts, for breakfast (seriously, it's so good with coffee) or any day of the week- you will not regret it! Makes 4-6 servings. See notes below. Preheat the oven to 375ºF. Grease an 8 or 9" baking dish with butter to keep the fruit from sticking. 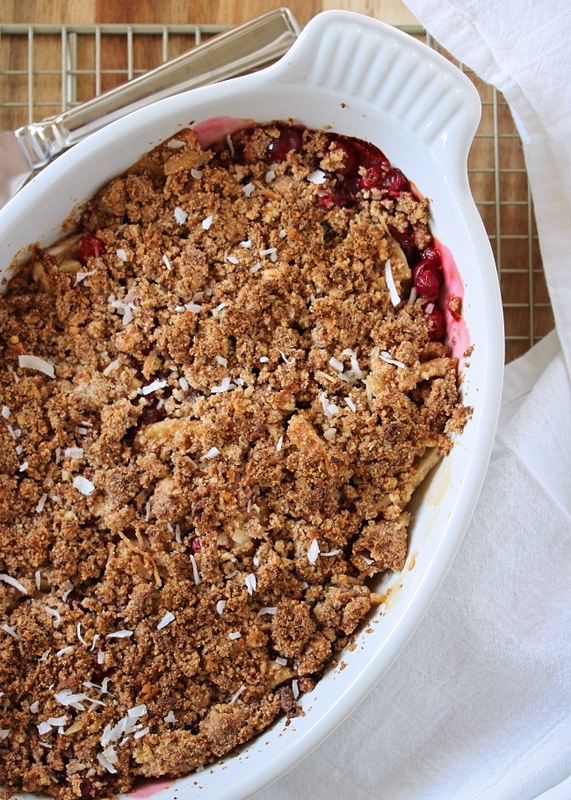 Add the apples and cranberries to the greased dish and toss with arrowroot and honey to coat. In a small bowl, combine the topping ingredients. Sprinkle over top of the fruit and pat into an even layer. 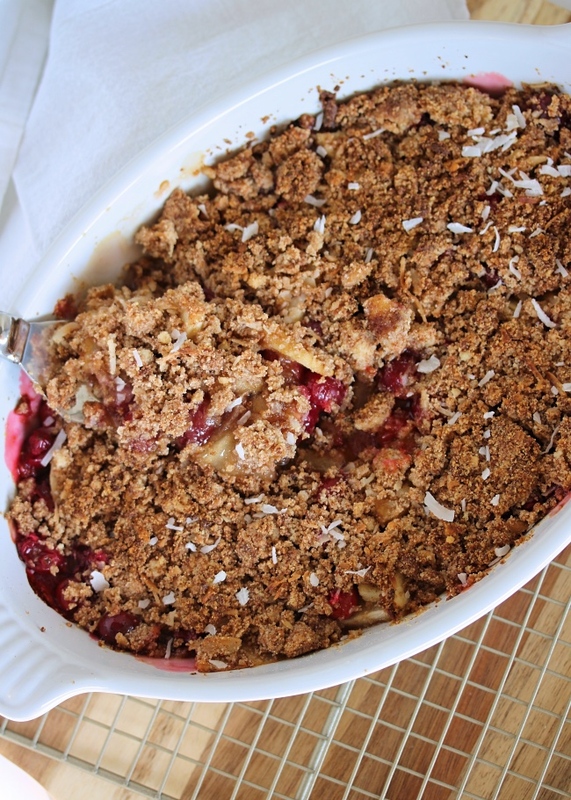 Transfer to the oven, and bake for 30 minutes or until the fruit is soft and the crisp topping is light golden brown. 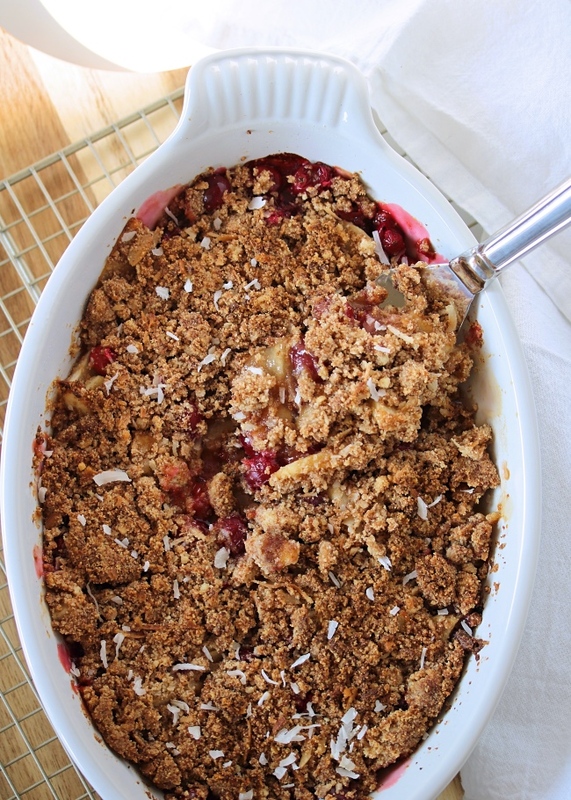 Feel free to double the apples in this recipe, or substitute cranberries for another berry you have on hand. 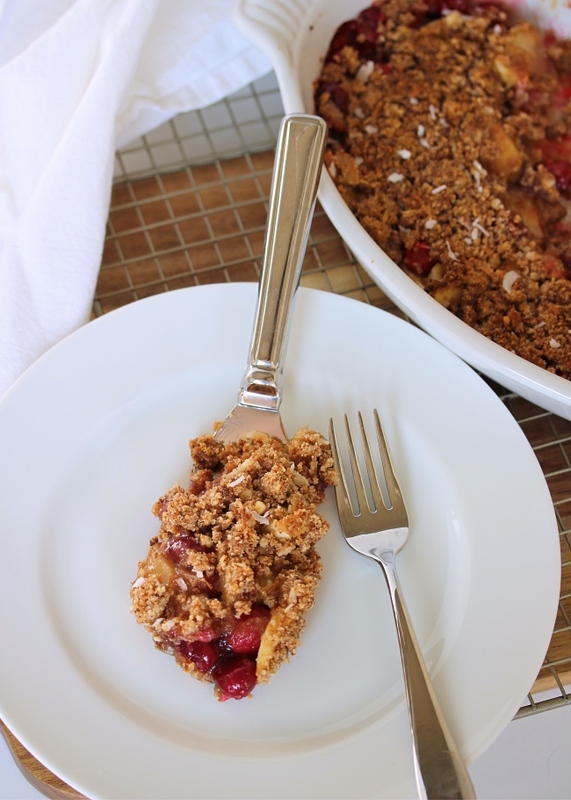 For a larger crumble, double the recipe for both the filling and topping and fill a large 9 x 13" baking dish. The cook time should be about the same, maybe 5 minutes more to brown the top.